Sit back and relax in our ultra-comfortable private carriages and enjoy an approximate 45 minute tour of the city like no other. This carriage is ideal for couples, but it can comfortably hold up to 6 adults. Since there are no other passengers, you can ask your driver for any type of tour…history, ghost, or even a combination. 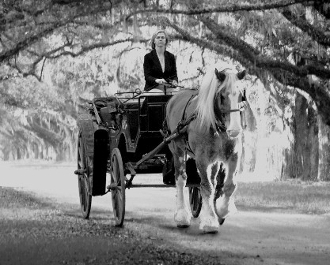 Of course, if you want a quiet, romantic ride, your driver can simply transport you through the quiet neighborhoods in the beautiful Historic District. Private tours are very popular, therefore, reservations are strongly suggested. For an additional fee, we are available for special pickup and drop-off locations throughout the city, as scheduling permits. Pick-up and Drop-off fees outside of City Market range from $15 to $50 depending on location within the Historic District and as scheduling permits. Give us a call if you would like to make arrangements for such pickups. The fare of $135 is for the first two passengers. Additional passengers extra. Wish you could have a little more time with us? We now have that option! For an additioanl $25 you may upgrade your tour to a full, one hour tour, and see even more! Meander through quiet neighborhoods, travel off the beaten path, travel a little further than you will on our standard tours. Simply select "Add Time" when checking out online! We want this experience to be all you'd like it to be!